Stress rash, also referred to as hives or urticaria, is one of the most common symptoms of stress. Here, we discuss the science behind it and outline the major symptoms and treatments. Stress rash can appear anywhere on the body but most commonly affects the back, arms and face. 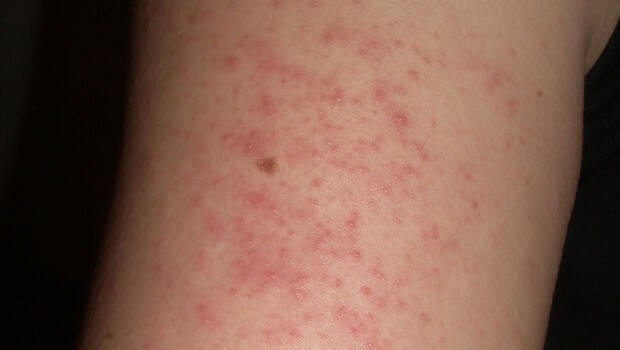 The rash can be flat or raised and is usually red and itchy. Some sufferers also report a burning sensation. Stress rash can come and go quickly, often in just 8-12 hours. Sometimes, however, the rash will last longer. Symptoms can persist for 6-12 weeks at a time. In roughly one in 10 cases stress rash becomes chronic. Stress rash can affect both genders but is more common in women. It can affect people of any age but is most common between the ages of 30 and 50. A wide body of scientific literature confirms the link between high levels of stress and the incidence of rash. A 2005 study at Taiwan University into the link between stress and chronic skin rash concluded that stress is ‘an important factor’ in the development of chronic skin rash. The researchers found that individuals suffering from chronic skin rash were more likely than average to have suffered a stressful event in the six months before the onset of symptoms. A 2012 study at Hacettepe University in Turkey reported that 24.7% of cases of chronic skin rash were caused by stress. A 2013 study in Brazil placed the figure at 16%. Post-traumatic stress disorder has also been linked to stress rash. A 2010 study at the University of Plymouth found that individuals diagnosed with chronic skin rash were almost twice as likely as average to be suffering from PTSD. No one is sure of the physical reasons why stress causes a rash. One theory is that stress rash appears when the body releases too much histamine in response to a stressful event. This excess of histamine is thought to produce the classic symptoms of red, itchy bumps. In the short term, oral antihistamines can bring down swelling caused by an excess of histamines in the blood stream. You can normally either buy such antihistamines over the counter at a pharmacist or ask your doctor to prescribe them. Applying a cold compress to the affected area for 5-10 minutes can also reduce itching and inflammation. Because of the difficulty in pinpointing the exact cause of stress rash, the most effective form of treatment is often to lower general stress levels. Exercising regularly and eating a balanced diet are two ways to achieve this. Foods high in Omega-3 like salmon and flaxseed oil can be particularly beneficial in bringing down the inflammation associated with stress rash. Researchers have identified insomnia in particular as a risk factor for the development of chronic skin rash. A good night’s sleep, therefore, is also likely to benefit those suffering from stress rash. This has been very helpful. I had rash whose cause I didn’t know. A visit to a doctor surprised me that stress can actually cause a rash. Now I am working on managing my stress levels.